Christmas is, of course, the time to be home – in heart as well as body. 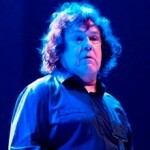 Gary Moore was a Northern Irish musician, most widely recognised as a singer and virtuoso guitarist. In a career dating back to the 1960s, Moore played with artists including Phil Lynott and Brian Downey during his teens, leading him to memberships with the Irish bands Skid Row and Thin Lizzy. Moore shared the stage with such blues and rock musicians as B.B. King, Albert King, George Harrison, and Greg Lake, as well as having a successful solo career. He guested on a number of albums recorded by high-profile musicians.